I almost chose to use The Open Sea and am so glad I didn't. 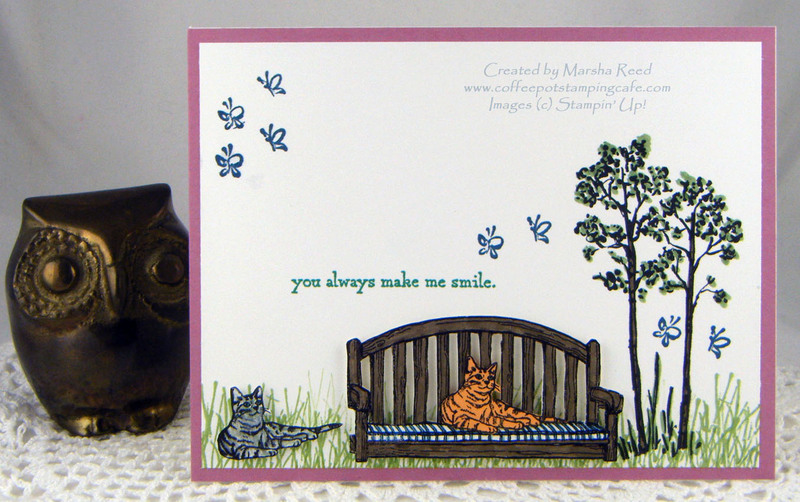 Your card is gorgeous, Marsha. I love that stamp set and will never give it up. The Hello Honey makes me think of a warm sunset, bathing the world in gold. Looking closely I recognize the DSP. 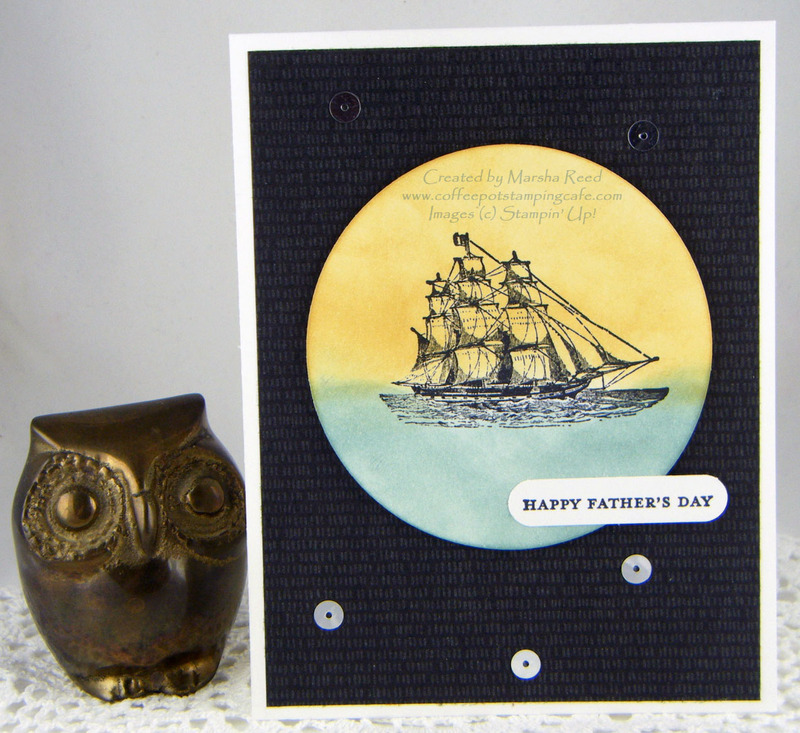 I wouldn't have thought it would work so well with a sea-themed card, but wow, it really does! 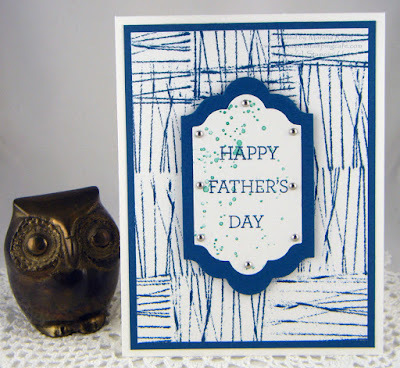 I've never tried stamping with Baker's twine wrapped around my acrylic block but now I am going to have to. I was trying to figure out which stamp set you used and then read your description. Love the technique! Why haven't I heard about it before this? You're certainly getting a lot of use out of the In the Meadow set, aren't you? I suspect you did a "happy dance" when it made the new Annual Catalogue. But combined with the new Sitting Here set, it looks as if the two sets were made for each other. Love both cats although the ginger looks so much like my daughter's Honey that I expect her to meow at me. Thanks so much for being part of our awesome Wacky Watercooler blog hop! Thank you, Heidi! The Open Sea is one I won't give up, either. Loved that In the Meadow is going forward. It's turned out to be a favorite. I enjoy our blog hops. I am so sad to see the Open Sea set retire, it was my number one go to set for masculine cards. So glad you decided to use it for your card. Your second card is so fun! What a creative idea to wrap Bakers Twine around a block. Love it! My favorite though is the Sitting Here card. Love everything about it! Thanks, Marie! There are so few truly masculine sets that this is one I'll keep even when it's retired. Great spread of cards Marsha! I love the Open Sea. I never got that stamp.....terrific card you made using it. I especially like the Father's Day card. GREAT idea to create a background with twine - brilliant! Made a wonderful masculine card. And, of course, new stuff. No pre-order yet. Not sure just what I want. That cat is too cute. Maybe it will be this set. Thanks for the ideas! Marsha your Open Sea card is wonderful. That has been one of my "go to" stamps for my masculine cards too, so I'm really going to miss it. I love how you used the DSP from Botanical Gardens, It really looks great with the image layer. Like Heidi I'm not familiar with the technique you used for your Father's Day card, but I love it. What a fantastic and simple idea. This is a great card. When I saw you were using Sitting Here for your "something new" project I had to scroll down right away to see what you made. I wasn't disappointed. Great card. Love those two cats. Thanks for sharing your talents. Thank you, Penny! I've used The Open Sea often and I, too, am sad that it is retiring. How fun to have a striking new (and easy) way to make a background--thanks for sharing how you did it, as I was sure you used a stamp! I love your Open Sea card--like everyone else I'll be sad to see it go; your card is so pretty and serene! Also liked your Sitting Here card--how clever to turn it into a bench! I love that Open Sea stamp set and am sorry to see it go. Your cards are your Father's day cards and also love your card with the cats. They look so relaxed. Thanks, Heather! I'm sad to see it go as it's a go to stamp set for a guy card which is why I'm glad I have it.